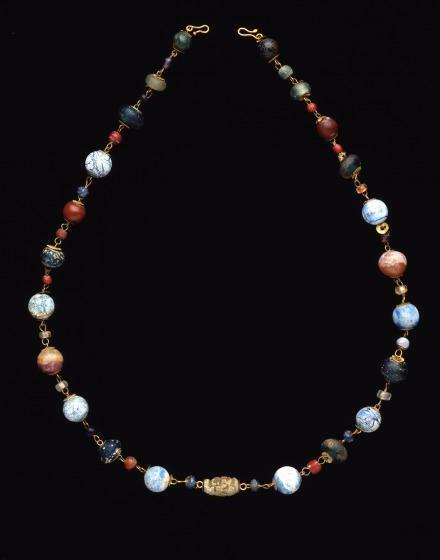 This Hellenistic Greek necklace is formed of large and small globular beads and an oval bead in the center. The larger beads are made from semiprecious stones or glass and are held by rosette-shaped cups; the smaller beads are of similar shape and material. Each is threaded onto a wire loop, which is linked at each end to the neighboring one. The clasp is modern. 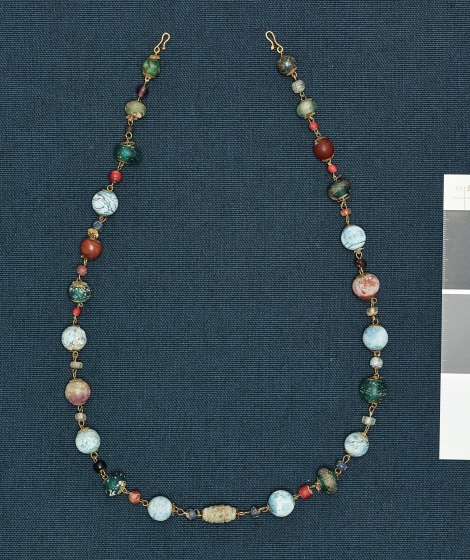 This necklace illustrates a fundamental change in Greek jewelry during the 2nd century BCE: colored effects were no longer applied only to enhance naturalistic decorative motifs and details such as the petals of a flower or the eye of an animal; they were now used in their own right. The bright colors of precious stones were set off against the warms shades of the gold. Although naturalistic motifs continued to be used, they were no longer the preeminent factor in Greek jewelry. The abstract combination of different materials and colors became more and more important. 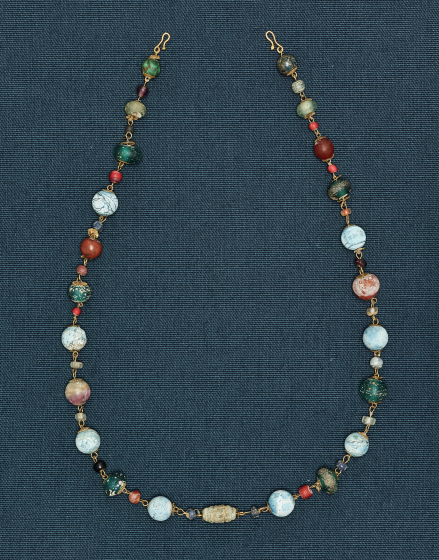 Barbara Deppert-Lippitz, Ancient Gold Jewelry at the Dallas Museum of Art (Dallas: Dallas Museum of Art in association with the University of Washington Press, 1996), 65; 138. Read an essay about Hellenistic Jewelry on the Heilbrunn Timeline of Art History.